The Hungarian foreign minister presented a high state award to Wess Mitchell, the US State Department’s former Assistant Secretary of the Bureau of European and Eurasian Affairs, in Washington, DC, on Wednesday. Mitchell received the Order of Merit of the Republic of Hungary, Officer’s Cross, in recognition of his outstanding achievements in advancing Hungarian-US relations. Presenting the award, Péter Szijjártó said that under Mitchell’s direction of his department “a new chapter had opened” in relations between the US and central Europe with Washington considering the region again an ally. With Mitchell in office, US-Hungarian relations were guided by “two magic words: mutual respect”, Szijjártó said, noting his role in arranging a visit to Budapest by US State Secretary Mike Pompeo for the first time after seven and a half years. The Hungarian foreign minister commended the former US diplomat for his role in developing bilateral political relations which Szijjártó said “had in effect been non-existent” before his term in office. Szijjártó touched upon the “sensitive” issue of Ukraine, and said that Mitchell had seen that “Hungary cannot consider Ukraine from a purely geo-political aspect; for us, Hungarians, minorities are a very important cause”. 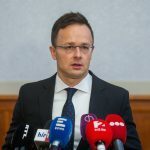 Szijjártó voiced satisfaction that the incumbent US administration “sees the Hungarian government’s policies aimed at preserving Christian values and which have the cause of security in the primary focus”. Accepting the award, Mitchell said it was a love for freedom that bonded Hungarians and Americans. As an assistant secretary, he said, he had seen an outstanding opportunity in promoting active diplomacy towards central Europe, primarily Hungary.